The day before the start of this year’s Hi-Rez Expo, I was waiting in the lobby of my hotel, killing time before I could pick up the information I’d need for the next five days in Atlanta. It was then that a bearded man in a blue esports shirt walked past me, stopping to chat with someone who stumbled across him in the lobby. At the time, I didn’t pay much attention to the man or his excitable companion. There were plenty of fans already milling around the hotel and so assumed the pair had met at a previous expo. The next time I saw Barraccudda, however, he was on the expo’s main stage, preparing for the Smite World Championship quarter finals against NRG Gaming. Here’s what’s coming up in Smite season 5. The first day of the tournament was busy with announcements, so while there were plenty of games going on, I was forced to watch them on the screens dotted around the expo. As time ticked on, it became clear that the next day would herald the first major clash of the tournament. Luminosity Gaming were set to take on NRG for a spot in the semi-finals. I had to get up close if I could. Hours before, this duel would have meant very little to me. But the expo centre was buzzing with excitement from the moment the teams were confirmed – it was impossible not to get caught up in the wave of enthusiasm. This was one of the most hotly-anticipated matches of the entire tournament, part of a story that’s evolved throughout Smite’s entire existence as a competitive esport. 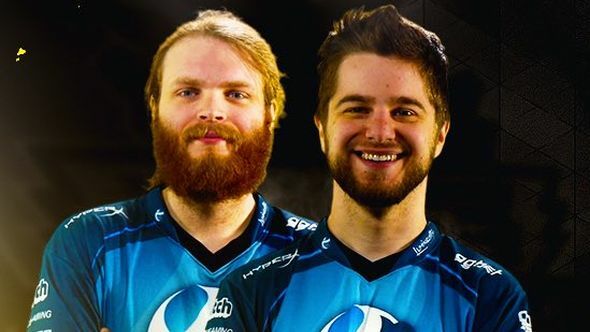 Luminosity’s JeffHindla and Barraccudda are a duo that have stayed together since the first ranked season. In 2014, they won the game’s inaugural World Championships, and the pair are the subject of an hour-long documentary about their relationship both on- and off-screen. By contrast, NRG were the two-time world champions from Europe, looking to secure their third consecutive championship. On top of that, they’d beaten the hometown hero – Barraccudda lives just 40 miles from Hi-Rez’s Atlanta Studio – in the semi-finals in both 2015 and 2016. I knew none of this before I arrived in Atlanta, but by the time the first game began I found myself torn. My instinct was to support my native Europe, but the genuine respect and affection that players, fans, and Hi-Rez staff all had for Luminosity saw my allegiance jump across the pond. As the Luminosity players were announced, the crowd roared, but no cheers were louder than those reserved for Jeff and Barra, the nicknames affectionately bestowed on the pair by the community. The first game of Luminosity’s best-of-three series was a hectic back and forth, but the mood surged in the moments the home team were on top. What was even more noticeable, however, was how dramatically that same mood fell as the tide turned further in NRG’s favour. A room filled with 2,500 people went quiet as they realised that the team many had come to Atlanta hoping to see win the entire tournament were struggling. When NRG eventually won the series 2-0, the air of disappointment throughout the convention was palpable. It’s no surprise that American fans were disappointed to see Luminosity lose, but I think it came down to more than a simple clash between NA and EU. In an environment so obsessed with tactical and mechanical ability over all else, Jeff and Barra exhibit a sense that it’s not just how good you are that determines how far you go – there’s something else. Their success and popularity wouldn’t exist without their skill, of course, but the passion and drive they exhibit factors in hugely to the respect they leverage from the community at large. There are undoubtedly standout players and iconic duos throughout esports. Smite’s own Adapting, for example, was described to me as arguably the best player in the world by more than one person at HRX. League of Legends’ Korean scene has two enduring successful bot lane combos in the form of Longzhu’s Pray and Gorilla and SKT T1’s Bang and Wolf. But none of these examples seem to resonate with the wider fanbase in the same way that Jeff and Barra do for their game. By several metrics, Smite is still quite a small, albeit gradually growing esport, and as a result, the impression the duo leave will linger long after they have stopped actively playing. The existence of Jeff and Barra as a professional pairing, and the way they carried themselves both on stage and around the expo in general, made the entire event more welcoming, more real as a place not just to exhibit the best of the best, but to praise the people who helped build a 20-million strong community from nothing in just a few years. Personality is a trait not often lauded at the professional level but, on the rare occasions it is, the effect it has is felt far beyond the inner circle of a few dozen top-level players.